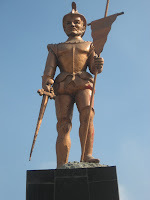 Portoviejo, the capital city of the province of Manabi, is one of the oldest and hottest cities in Ecuador founded in 1535 by the Spanish. It is the 6th largest city here with a population of 250,000. It is about one hour south of Bahia and located 40 km inland from the coast. It was once a port on the Rio Rocafuerte but river silt has filled the once riverbed as a result of deforestation. 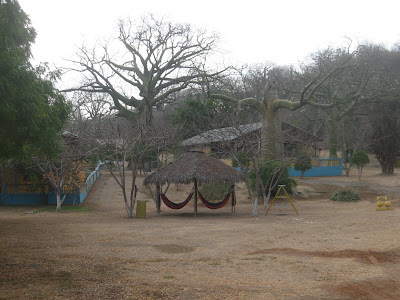 It is famous for the beautiful tamarind trees found in the area. Here you will also find Kapok pillows and mattresses made from the fluffy fibre found in the seed case of the large Ceibo tree. 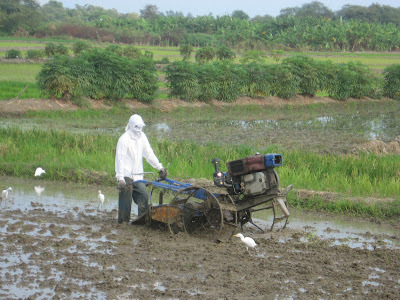 The nearby agricultural areas of Rocafuerte are lush and green, and here you see a ricefield under cultivation with a very specialized, yet primitive tractor. The first several times we traveled here by bus, taxi or with friends. This was very helpful as when we actually drove in a car ourselves the main roads to Portoviejo are not clearly marked, and the urban streets do not have any signposts.. A city map is of little use if you cannot determine and coordinate your position with a street sign, and adds little value with the challenges of one way streets, construction activity, and traffic barriers. Asking for directions you will always get several differing answers – so you learn to rely on landmarks and previous experience. Obviously more experience is directly proportionate to getting lost less and a more pleasurable adventure. 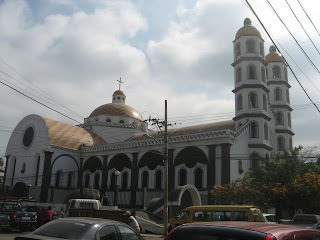 The coastal and rural populations often travel to Portoviejo for the markets, shopping malls and greater diversity of merchandise choices, movies, and cultural or sporting events. The residents are very friendly and seem well educated. The main campus of the Universidad Tecnica de Manabi ( similar in size to U.B.C. ) is located here on Avenida Universitaria and they have Jardin Botanico - excellent gardens for public enjoyment. Their transportation department boasts about 50 large buses. One afternoon we encountered about a dozen students from the Vincente Hurtado Colegio Educativa in Bahia where I taught for one month. 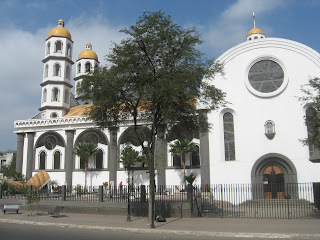 We have now been to Portoviejo several times to sightsee, shop, and once to obtain our official government documents known as cedulas, and migratory certificados. This is an interesting process whereby foreigners are fingerprinted on both hands ( locals need only a single hand thumbprint ) for offical government recording. There is not any facility for washing the ink off your hands, and people resort to simply wiping it off on the nearest wall. The walls, some years ago a light colour are now mostly a dirty black smear ! 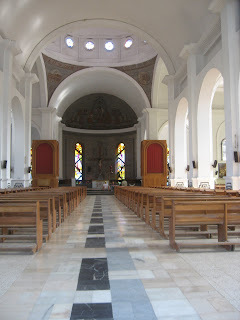 Sloths can be seen in the central plaza - Parque Eloy Alfaro which is adjacent to a famous traditional old church for which Portoviejo is it's home. Street market stalls commingle with more modern facilities like cybercafes, the Dr Julio Villacreses Colmont Hospital, the province's primary cancer treatment facility, and technically advanced large electronic display billboards. Portoviejo and nearby Manta on the coast currently have the closest domestic airports for the entire Manabi province. The domestic airport across the bay from Bahia de Caraquez in San Vincente is scheduled to reopen shortly for domestic service several times a week. 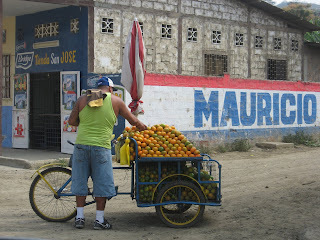 Nearby is a small village of Sosote known for the horrible condition of it's mainstreet which is unpaved washboard, and its tagua carving workshops. Tagua is a white ivory like nut which can be carved into a variety of beautiful figurines. And nearby towards Manta is Montecristi whose residents since 1890 have become famous for their weaving of Pananma hats. Most of the actual weaving is done in the rural countryside and brought into the village's mainstreet shops to sell. For anyone that wishes a culinary adventure to Ecuador from the safety of their own kitchen here is a link for recetas to some favourite Ecuadorian dishes. A cautionary note - depending on the season, and your location you may have difficulty obtaining all of the fresh ingredients !